Tissot Tissotsonic Stainless Steel case and bracelet Wristwatch Circa 1970s. 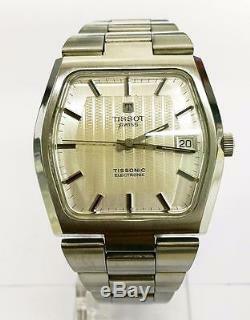 A Tissot Tissotsonic Electronic watch, clean watch with date, tissot bracelet, nice size for a retro from the 70s. Comes with a 6 month, non-waterproof service cover, not including any breakages or misuse. CHECK MY SHOP/STORE FOR ALL OTHER ITEMS. The item "Tissot Tissotsonic Stainless Steel tuning fork bracelet Wristwatch Circa 1970s" is in sale since Tuesday, October 25, 2016. This item is in the category "Jewellery & Watches\Watches, Parts & Accessories\Wristwatches". The seller is "jonawc" and is located in 02072503734 ClerkenWell RD. This item can be shipped worldwide.